Kanat “The Kazak” Islam Super Welterweight Contender Knocking on the Doors of the Champions! This writer on February 17th at the Chase Center in Wilmington, DE, had his first look at Kanat “The Kazak” Islam, 23-0 (19). He was born in Altay, China as Hanati Silamu in 1984 and ended up in KAZ while now living in Pahokee, FL. In DE Islam received a very bad cut over his right eye in the beginning of the first round from a clash of heads with his opponent Robson Assis, 16-3, of BRZ. He knew that at the end of the round there was a chance of the ring physician halting the fight so he went for the knockout that came at 2:12 of the first round. His trainer is Nelson Lopez, Sr.
As an amateur Islam who won a Bronze Medal at welterweight at the 2008 Beijing Olympics. He defeated boxers from Zambia, Cameroon and the Bahamas (Taureano Johnson) before losing to Carlos Banteaux of Cuba. He also won a Bronze Medal in 2006 at the Asian Games in Doha, Qatar. He won over boxers from India and UBZ before losing to a boxer from KAZ. In the same year at the World Cup in Baku, AZB, he defeated an Egyptian but lost to a Russian and a boxer from UKR. In 2007 at the Asian Championships he won a Bronze Medal in Ulan Bator, Mongolia. He defeated boxers from Iran and UZB before losing to one from Mongolia. In the same year in Chicago he defeated boxers from UZB, Australia, AZB, KAZ before losing in the semi-finals to a boxer from Thailand gaining a Bronze Medal. The boxer from KAZ was the one he lost to in 2006. In 2004 at the Olympics in Athens, Greece he defeated a boxer from Uganda before losing to a boxer from AZB. 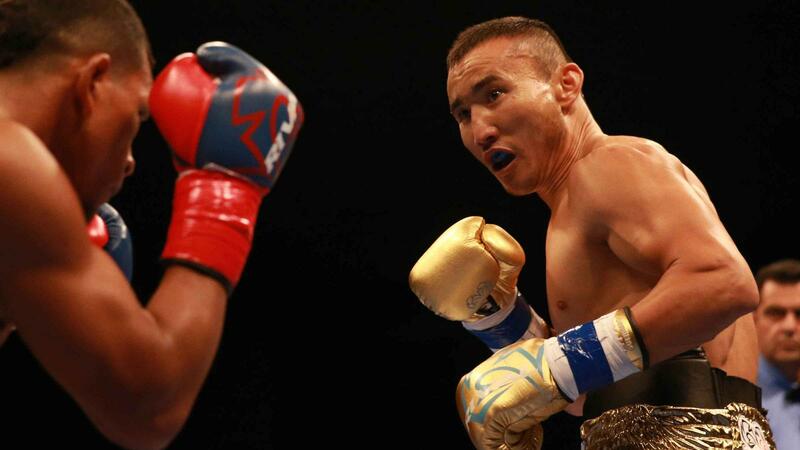 In the World Series of Boxing in the 2010-11 season for the Astana Arlans Islam went 5-1. He defeated boxers from Armenia, BRZ, UZB, US (Russell Lamour) and France before losing to one from AZR. In the 2011-12 season he went 3-3 defeating boxers from the US (Lamour), Georgia and Bulgaria. He lost to boxers from Russia (2) and UKR. Islam would turn professional right after the 2012 Olympics in September stopping five boxers in the DR then went to Colombia for a pair of stoppages and back to the DR in December going 8-0 in just three months in 2012. In 2013 he was 8-0 improving his record to 16-0 with 13 stoppages, two wins by DQ and one decision. Following those two years things slowed down to only having two shows a year in 2014, 2015 and 2016. The biggest wins Islam has had were over Humberto Toledo, 41-8-2, in 2012 winning the vacant WBA Fedecaribe super welterweight title. He knocked out Jose Vidal Soto, 24-14-2 in 2013. He won a fight in FL in April of 2013 stopping Yolexcy Leiva, 5-5. In Ecuador he defended his title with a decision win over Eduard Flores, 15-8-2. In another fight there he knocked out Emilio Julio Julio, 28-11-2, for the vacant WBA Fedelatin title. He would defend it four times with the last one in 2016 also winning the vacant WBO Inter-Continental title by decision over Patrick Allotey, 34-2, in Almaty, KAZ. In 2014 Islam knocked out Fidel Monterrosa Munoz, 32-9-1, in Colombia. In 2015 back in FL he knocked out Jonathan Batista, 15-7. In 2016 he stopped Juan De Angel, 18-3-1, in FL. His last ten opponents had winning records. Islam is ranked No. 4 in the WBA, No. 6 in the WBO and No. 15 in the IBF. He’s fought in DR eleven times, COL five times, ECU twice, and KAZ and DE once each and FL three times. IBF champion Jermall Charlo has vacated his title to compete at middleweight. Canelo Alvarez has the WBO where Islam is No. 6. Erislandy Lara has the WBA super title and talking about moving up to middleweight. The WBA regular champ is Jack Culcay and the WBA are trying to get only one champ per weight class. After the cut he suffered in his most recent fight he will probably be ready to fight again in three or four months. Tureano Johnson who he beat in the amateurs is the No. 1 middleweight contender in the IBF.